School seems to be on full speed these weeks, and the Senators seem to be seeing a slow week as well, as seen here in their latest biweekly report! You can also find our previous biweekly reports here, or in the Senators’ blog. The McGill Non-Smoking Policy is ready to be presented to the highest admins, before it is brought to the McGill Senate. The plan is to implement it by September 2017. Discussed the implications of the report from Scholarship and Student Aid Office (SSAO) that there is a huge surge in bursary applications this year, especially from international students. Most of the new Student Senators for 2017-2018 has been elected! In the February 15 Senate Meeting, a Senate Motion submitted by a SSMU Senator, to recognize and promote Black History Month at McGill, was passed. The Senators discussed the University’s Strategic Academic Plan (2017-2022), which was up for open discussion at the February 15 Senate Meeting. The implementation of preferred names at McGill has seen progress in recent weeks, allowing students to use their preferred names in McGill-related contexts if they choose. Find out more about it here. Can’t believe we’re just now hitting February! The Senators have been busy at work and here is their second biweekly report of the term! You can also find our previous biweekly reports here. Dean of Students Christopher Buddle came over to Senate Caucus and discussed many things. Some highlights include the definition of the “McGill Context” as it applies to the Code of Student Conduct at off-campus events, as well as mental health training for faculty members. Laura Winer, the Director of Teaching and Learning Services, also came by for a chat. Among other things, we discussed course evaluations and solutions to noise disturbances in Leacock due to the construction. The Wellness Hub Student Stakeholder Group is now looking for student representatives. Apply here. The Winter term has started and the Senators have also begun with Round 2! Here is the first biweekly report of the term! You can also find our previous biweekly reports here. We discussed progress the Senators have made in advocating for a Fall Reading Break. 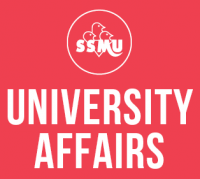 The Faculty of Engineering, however, has raised a valid concern regarding their accreditation mandating a specific number of teaching days that might be compromised with the implementation of a Reading Break in the Fall term. We again discussed governance reform at McGill, in relation to the Senate Question on University Governance Best Practices that was submitted to the January 2017 Senate meeting. We discussed final exam deferrals. It seems that the pilot project for exam deferrals did not create a spike in deferrals compared to previous semesters. 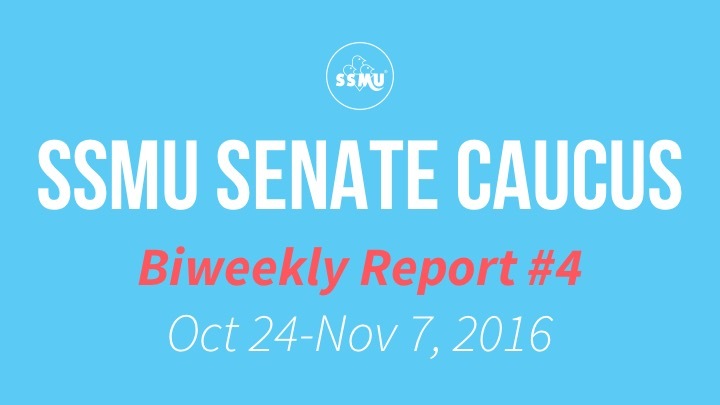 What did McGill Committees do in Fall 2016? Read the report! There are as many as 47 University-level committees, to which there are 118 undergraduate student representatives. McGill University is huge, and most of the groundwork for new initiatives on campus begins in such committees. Now that we’ve reached the end of the term, the Senators are wrapping up their work as well. Here is the last biweekly report of the term! You can also find our previous biweekly reports here. At the November 21 Senate, the McGill Policy Against Sexual Violence was passed! We discussed the construction around campus and how it was hindering accessibility for some students. After asking a Senate Question on this topic, we discussed some improvements that were immediately acted upon or promised in the future (e.g. fixing gaps between the street level and the sidewalk in crossings on McTavish). Presenting the SSMU Senators’ fifth biweekly report! You can also find our previous biweekly reports here. The Senators attended the annual Joint Board-Senate Meeting, with the topic of “McGill’s Sustainability Plans and Initiatives” on Thursday, November 10. The discussions have been compiled into a report presented to the November Senate here. We discussed the recent changes to access for urgent care at McGill’s Counselling and Mental Health Service (CAMH). The recent changes left a gap in which students who do not fall into the category of “Safety Appointments” are left without any options for urgent mental health service at McGill. We are working together with CAMH to address this issue. We discussed the policy for preferred first names. From now on, all issues related to preferred first names can be addressed to Heidi Emami (the Associate Registrar in charge of the preferred first name policy).